Image courtesy, California Highway Speed Rail Authority. 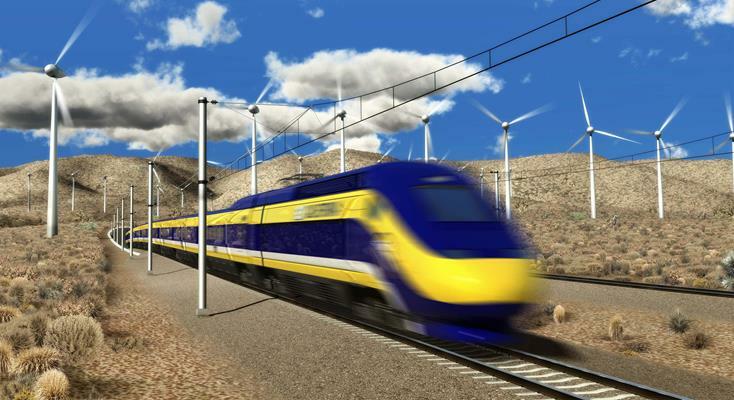 LOS ANGELES – The Los Angeles city councilwoman who represents the Sun Valley area introduced a resolution Tuesday opposing a proposed bullet train route through her district unless the plan is amended to be underground in the area. The proposed route, which still needs to be approved by the California High-Speed Rail Authority’s board, calls for the 38-mile Burbank-to-Palmdale section of the train line to include 24 miles underground and a portion in the Sun Valley area above ground. The Sun Valley community “already faces several environmental issues including landfills, auto dismantling yards, and heavy industrial uses abutting residential neighborhoods” according to the resolution introduced by Councilwoman Nury Martinez. Los Angeles Mayor Eric Garcetti said last month that he is “not yet” in support of the proposed route, but did say he hopes a tunnel or trench will still be considered for the San Fernando Valley above-ground portion. In a webcast last month where the route was announced as the preferred one among three being considered, Michelle Boehm, the rail authority’s Southern California regional director, said it “strikes the best balance” while considering safety, cost and the impact on communities and the environment. The $77 billion Los Angeles-to-San Francisco portion of the train project has an estimated completion date of 2033, but there is no funding in place yet to build the Southern California portion while work is currently underway on the Central Valley portion. 14 comments for "Los Angeles councilwoman wants bullet train route underground in SFV"
In 1971, there was a tunnel explosion in San Fernando, killing 17 workers. Tunneling in areas where hydrocarbons are present require special precautions and special procedures. The LA/Palmdale section is NEVER going to be built, it’s all wishful thinking. … our elected officials are drop dead stupid. Geology for idiots, 101: nothing (NOTHING!) can be built underground, in the San Fernando Valley (ancient Pleistocene lake bed; soils prone to liquefaction). Religiously, every 20 to 40 years, the San Fernando Valley incurs a major quake. You can bank on it. You’ll have another one one coming, just around the corner, soon after the holidays. How did you narrow down from a twenty year range in your first sentence to “soon after the holidays” in the third? This was why we ran earthquake drills when I was in high school. But we understood that “soon” meant potentially in our lifetimes, not before the next football season. Preparedness is important, because it can happen and eventually will, but using “there will be an earthquake anyway” as an excuse to sit on ones hands is foolishness that Californians cannot afford to indulge. Building a tunnel is drop dead stupid, and has nothing to do with preparedness. Read the comments above. It is foolishness to build this tunnel. The BART tunnel under San Francisco Bay did fine during the Loma Prieta quake that collapsed a section of the Bay Bridge and sections of the freeway in West Oakland. They obviously didn’t use Geology 101 but a more advanced geology. So, they can build tunnels under water in earthquake zones. Then, there’s the Chunnel. Yes, there will be earthquakes. We should stop building all tunnels, bridges and subways. The California Aqueduct could crack so we should shut it down. Houses and buildings may be destroyed so they should be evacuated. Everyone should leave California at once. Run! Run for your lives! Each day I am more amazed by the level of ignorance. Not to burst anyone’s bubble, but there are two countries named Japan and China who live on the same Ring of Fire as we do in California. They have the same threat of earthquakes. One thing they have that we don’t: a high speed rail system. Theirs even have tunnels and bridges. Apparently you’re not aware that the engineers here aren’t as smart as the Japanese, due to our failing infrastructure, and light years away from anything close to their high speed rail systems. Check out our antiquated rail systems, and blame the ignorance on the people involved in fraud, and mismanagement, oh, and so much more. Remember the bridge collapse in northern California, you know, the bridge that was retrofitted to withstand a major quake? We certainly are far behind. Since we have zero experience in building high speed rail, it will require expertise from outside to assist. That will be $5 Trillion dollars more. That’s OK. Tax Payers will pay for it.